Oh noooOoo.. there goes my decade-old crockpot! It tore at the rim just as I placed the heavy clay pot onto the heating base *sad*. I was going to slow cook a herbal chicken dish for dinner but ended up using the oven, going the foil-wrap way. The meal turned out oh-so-yummy but then again, my lack of fussiness is surely a bane to food critiquing and any real assessment taste-wise. I have the genes of a regular mom (although I'm not one myself) when it comes to food and wastage. 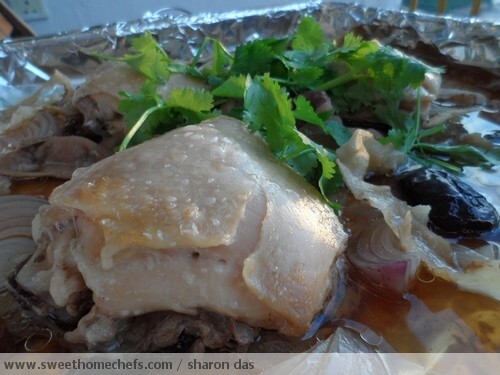 This is my version of Foil-Baked Herbal Chicken. It's simple to prepare - just involves throwing everything together and leaving it to cook. The end result is tender chicken in a rich flavoured sweetish soup gravy. 1. Rub a little salt and pepper on the chicken pieces. 2. Line the inside of the baking dish with foil. Spread chicken pieces, dates, onions, yu zhu on top. Pour diluted oyster sauce in at the sides (Add more water/sauce if you want more gravy). 4. Garnish with coriander and serve.